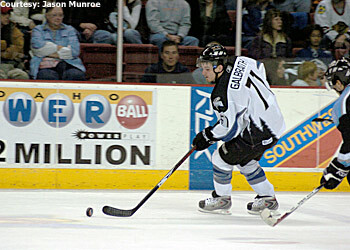 Lance Galbraith has found the time to rack up 128 points in his last two ECHL seasons. That's what separates the Victoria Salmon Kings, Idaho Steelheads and Alaska Aces in the West Division standings. If you ask Steelheads forward Lance Galbraith, the Kelly Cup Playoffs already have begun. "Every game's a battle," Galbraith told NHL.com. "Every team's playing every game like it's their last. No game has been an easy one, especially being the champions from last year. Every team is gunning for us." Idaho and Victoria have been in a hotly contested divisional battle for the past few months, while Alaska has won seven of its last 10 games to jump in the mix. While the Salmon Kings have a game in hand on the Aces and two on the Steelheads, it's a possibility the division crown won't be decided until next Saturday -- the final day of the ECHL's regular season. "They're on fire," Galbraith said of the Aces. "They weren't playing that great, but I guess every team goes through that. They've turned it around. It looks like they're getting guys sent down from (AHL) Peoria that are helping them out. Having a Josh Soares on your team doesn't hurt, either." While Idaho coach Derek Laxdal is more concerned with making sure his team is prepared for the postseason, he understands the importance of home-ice advantage. "We went through this last year being a four-seed and going through the playoffs," Laxdal said. "We're really not worried about where we finish, but we've got an opportunity to make a run for it here." In order for the Steelheads to have a crack at the division title, they're going to have to figure out a way to beat the Fresno Falcons. Idaho's final three games of the regular season are against Fresno -- a team the Steelheads have yet to beat this season (0-4-1). The Steelheads visit Stockton on Friday. "If we can get the first win in Stockton, we can give ourselves a chance," Laxdal said. "We haven't beaten Fresno all year. We just haven't had a good lineup and we haven't played well against Fresno. We have to make a statement against them." Idaho received a huge boost in its attempt to win back-to-back Kelly Cup championships when goaltender Steve Silverthorn was reassigned by the American Hockey League's Iowa Stars on Monday. The 27-year-old was the backbone of last year's postseason run, winning 16 games for the reigning champs. With Silverthorn back in the mix, the Steelheads are primed to go deep into the playoffs once again. "He was the MVP of our team last year, and not just in the playoffs," Galbraith said. "To get that kind of a boost with four games left in the season … I know everybody's excited here in Boise." Laxdal has to be excited, considering he has three quality goaltenders at his disposal going into the playoffs with Silverthorn, Kellen Briggs and Matt Zaba. While it's unusual for a team to carry three netminders on its postseason roster, Laxdal didn't rule it out. "We've got three No. 1s right now, so there's a big decision for me," Laxdal admitted. "Obviously, it's a good problem to have. It's a win-win situation." 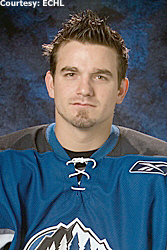 Silverthorn was reassigned to Idaho after Iowa signed goalie Matt Climie out of Bemidji State University on March 20. Silverthorn went 2-5-0 with a 3.36 goals-against average in nine AHL appearances this season. "I guarantee he wasn't very happy, but that's just his competitive nature," Laxdal said of Silverthorn's reassignment. "I think Silvie's worked for everything he's gotten. He played pretty solid up there. That's the hockey world. Teams are looking for the future." As for Laxdal, he'll be looking for players such as Silverthorn, Galbraith, Marty Flichel and Mark Bombersback to lead the team to another championship. Galbraith is enjoying another tremendous season, as the gritty forward has 20 goals, 44 assists and 258 penalty minutes in 62 games. Flichel is 18-47-65 in 60 appearances. "We've relied on them the whole year," Laxdal said of Galbraith and Flichel. "I think the first two months they really didn't have great months. They've really picked it up since then. With the additions of John Lammers, Mark Bombersback and Aaron Gagnon … I think we're as deep as anybody going into the playoffs." The only question as far as Galbraith is concerned is, would another solid postseason earn him another chance in the AHL? The 28-year-old -- who appeared in three games for Bridgeport last season -- had 11 goals, 16 assists and 64 penalty minutes in 21 playoff games last season. "I'd like to get to the American Hockey League," Galbraith said. "At my age, I know there's younger guys out there who will probably get the chance before me. I'd be real excited. I was up there last year. I don't try to change from year to year." Indeed he doesn't. It truly is remarkable Galbraith has found the time to rack up 128 points in his last two ECHL seasons, considering the fact that he's been given 496 minutes in penalties in the same amount of time. "You'd think I'd have more points if I learned to stay out of the box, but that's the way I play," Galbraith said. "I'm an in-your-face player. I have to play that way. I do get a lot of penalties, but I do draw a lot of penalties. I don't think I can change, or I'd end up getting a day job."